We must have all been good this year given the fact that we are in for some good telly in the coming weeks. If the news of the Downton Abbey Christmas Special, the Christmas Day Sherlock mini-episode broadcast or the New Years Day premiere of Sherlock 3 on BBC One wasn’t enough, we now get confirmation that Jenny, Trixie, Chummy and the ladies of Nonnatus House will return to BBC One on Christmas Day in the UK and on Sunday, December 29 on PBS in the States. The festive episode will air at 6:15pm on Christmas Day on BBC One and at 8:00pm CT/9:00pm ET on PBS. While both sides of the pond ready themselves for the coming season of Call the Midwife as they leave the 50’s in their bike’s rear view mirror and get ready for the swinging 60’s, the Christmas special promises to be festive on one end, poignant on the other and all things in-between. Without giving away too much, we can divulge that the drama this year revolves around an unexploded WW2 bomb. Nothing screams Christmas like the presence of a UXB in London’s East End. 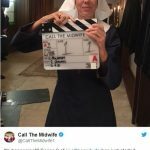 If you’re looking to bring a bit of Call the Midwife into your home for the holidays before Christmas Day, check out the just released CTM Christmas album.